Chances are you’ve heard of The Four Agreements. If you’re a bookseller, you definitely know it. Published in 1997 it has sold five million copies and continues to sell solidly week in and week out almost twenty years later. 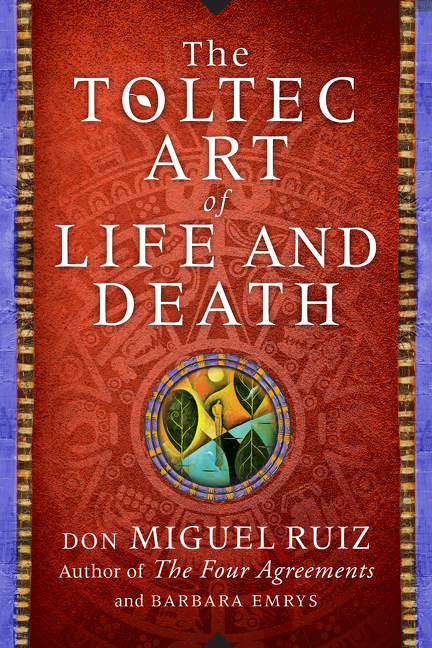 This new book incorporates Don Ruiz’s teachings with a personal spiritual journey he underwent during a nine-weeks-long coma after a near fatal heart attack. In a serendipitous follow up this week, Time named Taylor to its 2014 list of “The 100 Most Influential People in the World” noting that her “spiritual nonfiction that rivals the poetic power of C.S. Lewis and Frederick Buechner.” Read the whole piece here. Learning to Walk in the Dark (9780062024350) By Barbara Brown Taylor. $24.99 hardcover. 4/8/14 on sale. Of the many spectacular writers we publish, Barbara Brown Taylor may be the writer I love the best and the one to whom I return most often. She was a well-established and respected religious writer and thinker before she came to HarperOne in 2006. Newsweek had named her one of the top ten preachers in America, and one of the ten most influential living pastors in a nationwide poll of Protestant pastors. So her first memoir with us, Leaving Church: A Memoir of Faith, drew much attention and became a national bestseller for its thoughtful, inspiring reflection on how she “left church” while “keeping faith.” That book remains a strong backlist title for us and moved Taylor into the ranks of bestselling writers on spirituality like Kathleen Norris and Anne Lamott. Her second book with us, An Altar in the World: A Geography of Faith, also became a national bestseller. This tender, exquisitely written meditation on how to find sacred space in everyday life quickly found a permanent place among my bedside reading. Given the jittery, media driven, attention-sucking nature of daily culture, I return to this book often as a way of grounding myself. So you can imagine the pleasure I have in adding a new book by Barbara Brown Taylor to my library. I’m happy to say that Learning to Walk in the Dark is as thought-provoking, reassuring and delightful a read as the others. It poses the question: How might our lives become richer if, rather than avoiding and being fearful of darkness—physical, metaphorical, spiritual—we embraced darkness as the complement to the light in our lives. She posits that light and dark work together—and that that they have necessary and inevitable roles in making us complete. The advance reviews are very strong. Bookseller fans have made it an April Indie Next Pick and the initial media line-up includes a Time magazine feature, an excerpt in Time.com, and a Washington Post feature. I expect Taylor’s legion of fans will turn this one into her third bestseller. Based on a series of interviews between journalist Davidson and Jewish Renewal leader and rabbi, Zalman Schachter-Shalomi, it’s impossible to avoid a comp to Tuesdays with Morrie. But PW’s review points out how this book carves out its own distinguished and useful territory. The December Project: An Extraordinary Rabbi and a Skeptical Seeker Confront Life’s Greatest Mystery (9780062281746) by Sara Davidson. $25.99 hardcover. 3/25/14 on sale. Few are better positioned to offer a prescription for living a life of forgiveness and reconciliation than Nobel Peace Prize winner, Bishop Tutu. He identifies a four-fold path based on the wisdom of his experience, showing the way to release ourselves from cycles of anger, hurt and violence. The Book of Forgiving: The Fourfold Path for Healing Ourselves and Our World (9780062203564) by Desmond Tutu and Mpho Tutu. $25.99 hardcover. 3/18/14 on sale. Religion Short Take: Jesus: A Pilgrimage – James Martin, S.J. Jesuit priest James Martin has written two best-selling humor-tinged books on religion—The Jesuit Guide to (Almost) Everything and Between Heaven and Mirth. In this book he starts with the premise that what should be a life-changing encounter with the vivid, real-life person of Jesus is often turned into a cold series of dos and don’ts. He takes us on his personal spiritual journey and invites us to find our own way. Given Martin’s sales track and relationship with Stephen Colbert, expect good publicity and media coverage. Jesus: A Pilgrimage (9780062024237) by James Martin, S.J. $27.99 hardcover. 3/11/14 on sale.